I had a nice Nicoise Salad when having lunch with Holly and Rebecca at The Grove Cafe in Albuquerque (June 2006). I had the dressing on the side and brought home what I didn't use. 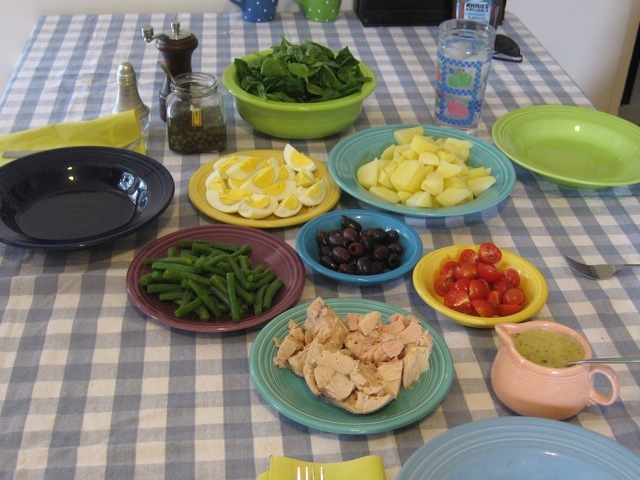 Charlie and I decided to make a Nicoise salad on our own to use it up. The salad turned out great. We decided it'll be something we make regularly. This is how we are making it now. We're still experimenting with the dressing, but the one below tastes good. The ingredients keep well left over if you let each person mix and dress his/her own salad, i.e., don't mix and dress it ahead of time. Just lay out the ingredients in individual serving plates. They look beautiful. Will make you want to take a picture. It works well to cook the potatoes, eggs, and green beans several hours ahead of time (or the day before) and store in the frig so they are chilled. But, if you don't make them ahead of time, just run under cold water to cool them off before slicing for the salad. Mix dressing ingredients in a blender (or simply shake in jar if you don't include garlic or fresh basil). Put individual salad ingredients on individual serving plates. Don't mix ahead of time. Give people large bowls in which to build/mix their own salad and dress as they like.